Mysore, the city of palaces was the erstwhile capital of the Wodeyars, and still retains the ambience of its royal past. This imperial city is about 140 kms from the Bangalore and is one of the famous tourist destination in India. There are various palaces, parks and shady boulevards in Mysore. The patron goddess of Mysore is Chamundeshwari. The Mysore city has everything to offer to its people - palaces, silks and sandalwood, the lingering aroma of incense, the delicious flavour of Mysore Pak, and the famous Dusshehra festival. Mysore was earlier known as ‘Mahishasura Ooru’. Mysore was named after the demon ‘Mahishasura’, who was slain by the goddess Chamundeshwari, the patron deity of the royal family. The hills dedicated to her stand at the eastern end of this charming town. The main tourist attractions in Mysore are the Mysore Palace, Brindavan Gardens and Chamundi Hills. Mysore Palace is the former residence of the Wodeyar rulers. This palace is a splendid structure in the Indo-saracenic style. The major attractions of this palace are the magnificent gold throne displayed during the Dussehra festival and a carved silver door. Brindavan gardens are the beautiful ornamental gardens which are built at the Krishnarajasagar dam. The main attraction of these gardens are the terraced lawns and the swirling musical fountains. The Mysore Palace was the former residence of the Wodeyar rulers. This palace was built in 1912 and is a splendid structure in the Indo-saracenic style. The Mysore Palace is one of the largest of its kind in India. The major attractions of this palace is the magnificent golden royal elephant throne with diamonds and other precious stones which is displayed during the Dussehra festival, the Durbar Hall, the Kalyana Mandap with detailed murals, gallery and a carved silver door. 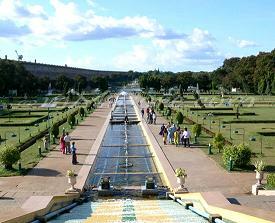 Brindavan Gardens are the beautiful ornamental gardens which were built at the Krishnarajasagar dam. The ornamental Brindavan Gardens were inspired by the Mughal Gardens in Kashmir. The main attraction of these gardens are the sprawling lawns, fascinating flowerbeds, tall trees, swirling fountains and ponds. These beautiful gardens attract thousands of visitors from all over the world. In the evening colourful lights transform the terraced gardens into a magical fairyland and the musical fountains dance to the tunes of either Ananda Shankar or Paul Mauriat. 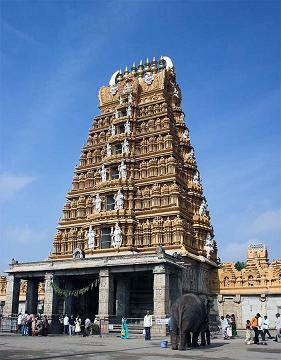 The other major tourist attraction in Mysore is the Chamundi Hills. The Chamundi Hills are about 1000 feet high and can be seen from any part of the city. As you drive up the hill, you will come across a 4.8 m monolith of Nandi, the Lord Shiva’s sacred bull. On these hills, the statue of the buffalo-headed demon Mahishasura with a cobra in one hand and a scimitar on the other hand is also situated. Right on the top of these hills, there is a 2000 year old temple which is dedicated to the goddess Chamundeshwari, the patron goddess of the royal family. According to the legend, the goddess killed the evil demon Mahishasura on these hills. There is a splendid view of the city from the top of the hill. This fine museum is housed in the magnificent Jayalakshmi Vilas mansion in the Mysore University campus at Manasagangotri. It has rich collection of over 6500 folklore articles andis perhaps the biggest of its kind in Asia. It was set up in 1892, during the rule of Chamrajendra wodeyar. The zoo is noted for its lush green environs and a rich variety animal life. Some rare and exotic species of animals kingdom can also be seen here. It is also known for breeding some rare animals in captivity. Jayachamarajennndra Art Gallery is located in the Jaganmohan Palace. This art gallery houses a collection of exquisite paintings of the 1875 period. This celebrated collection includes paintings by Raja Ravi Varma, the Russian Svetoslav Roerich and the traditional Mysore gold leaf style of painting. Besides paintings it also has a vast collection of musical instruments, curios, medieval playing cards and other antiques. St. Philomena's church one of the largest church in India. This church is built in the neo-Gothic style. This 18th century church has beautiful stained-glass windows. It exhibits locomotives and coaches of the erstwhile royal family of Mysore. Maharani’s Saloon built in United Kingdom (U.K.) and different types of signals are some important attractions. There is also a fine collection of paintings and photographs which describes the story of the railway. Sri Ranganathaswamy Temple is a blend of Hoysala and Vijayanagara styles of architecture. Images of Vishnu can be seen on pillars, ceilings and domes. The image of God is represented by the seven-headed serpent, after whom the island and its oldest structure are named. Gumbaz is the tomb of Tipu Sultan has splendid ebony doors inlaid with ivory, black pillars which create a dramatic contrast with the cream walls of the building, a magnificent dome and delicate minarets. The traditional gardens lead to the mausoleum. Tipu Summer Palace Bagh or the Garden of the Wealth of the Seas is situated on the banks of River Cauvery. This palace was the Tipu’s favourite summer retreat. This palace was built in 1784 in the Indo-Saracenic style. The palace is made of teak and has ornate and beautiful frescoes. An elegant room serves as a museum where Tipu’s gold embroidered tunic, his coin collection and some western paintings and engravings are on display. Ranganathittu Bird Sanctuary is located about 18 kms. from Mysore. This bird sanctuary is located on the lush island on the Cauvery River. This bird sanctuary is a home to various exotic varieties of water birds and crocodiles. Some of the birds migrate during the winter from Siberia and North America. It is possible to see them at a very close range through boats. The best period to visit this sanctuary is between June and February. Mysore is known for the aromatic incense sticks, Mysore Silks, Sarees, Mysore wooden toys, Sandalwood, rosewood, teakwood and ivory arts and crafts. You can shop for these special things in Mysore.A visit to the Government Sandalwood Oil Factory is a unique experience. Authentic sandal oil, sandal oil, sandal powder and scented incense sticks (agarbattis) can be purchased here. The Mysore Silks are known for their excellent quality and everlasting luster. Exquisite silk sarees are an owner’s pride and an integral part of Kannada culture and traditions. Govt. Silk Factory is a great place to see the work of master weavers and buy fine silks. Mysore is also famous for wooden toys and items made of brass and stone. The charming white coloured double storeyed palace is set on a ridge at the foot of the Chamundi Hills. It was built by Maharaja Krishnaraja Wodeyar in 1931, to accommodate the royal guest from overseas. The palace is designed in European – Classical style and the central dome was modeled after the St. Paul’s Cathedral in London. The palace interiors are embellished with finest of local craftsmanship and imported luxury fittings. It has now been converted into a luxurious heritage hotel.. The 18th century island capital of Haider Ali and his son Tipur Sultan is flanked by two branches of river Kaveri. The battle scarred ramparts of the fort reflects the heroics of Tipu, who valiantly fought the British and delayed their hegemony over Mysore. Within the fort is a mosque and the magnificent Ranganathaswamy temple. Dating back to 9th century, an evidence of secular and tolerant nature of Tipu. Tipu Sultan’s summer palace, Daria Daulatbagh and his mausoleum are located outside the fort. The palace is noted for its gilded wall panels, ornate arches and 18th century frescoes. Sacred Somnathpurn is one of the three jewels of Hoysala temple architecture, the other two are Belur and Halebid. The Chennakesave Temple here was built in 1268 A.D. during the reign of king Narasimha III, at the instance of his minister Somanatha Dandayayaka. Like other Hoysala shrines, it is set on a raised plinth with a star shaped ground plan, but unlike the Belur and Halebid Temples, it was actually completed. The temple complex has a triple – shrine (trikutachala), each with its own stunningly beautiful vimana and sukhanasi (vestibule) and a spacious common Navaranga mandapa. The outer walls are exquisitely carved narrating episodes from the legendary epics – Ramayana, Mahabharta and the Bhagvatha. The Jungle resort on the eastern fringes of famous nagarhole Wildlife Sanctuary has emerged as a popular tourist destination. The lush lover’s paradise. A jeep ride into the dense forests or a walk with a guide is a memorable experience. This historic and religious centre on the left bank of Kaveri was the capital of Gangas from 5th to 10th century. In 1116, Hoysala King Vishnuvardhana attacked Talakkad, under the Cholas and attained victory. To celebrate his victory, Vishnuvarhana built five temples dedicated to Lord Vishnu, one of them is the Kirtinarayan temple. Talakkad is also known for the five Shivalingas or the Panch lingas’ enshrined in beautiful temples. The famous ‘Panch Ling’ darshan, a bathing festival is held here on a rare astronomical combination that occurs at intervals ranging between four and fourteen years. The Vaidyeswara, Pataleshwara and Maraleshwara Temples contain three of the five Panch lingas. Vaidyeshvara temple was built around 1360 and is the largest shrine here. The Pataleshwara temple if famous for the unique linga, which changes colour from deep red in the morning to dark brown in the afternoon and white in the evening. Melukote or the ‘High Fort’, an important centre of Vaishnavite worship is well known for the five shrines dedicated to lord Vishnu known as the Panchanarayana temples. These were built by the Hoysala king Vishnuvardhana, after embracing Vaishnavism under the influence of Shri Ramajuja. The Famous Cheluvarayaswami temple atop Yadavagiri hill enshrines a fine statue of Lord Vishnu holding the Shanku (conch), Chakra (a disk like weapon) and a Gadha (mace). The spectacular 10 days vairamudi Festival is held here during Mar. – Apr. and attracts lakhs of devotees. Melukot is also known for its salubrious climate, scenic splendour and charm. The island town endowed with exceptional scenic beauty is 44 kms. From Mandya. It is surrounded by forests hills and valleys and famous for the two picturesque falls – Gaganachukki and the Bharacukki created by the two branches of river Kaveri. The Ranganatha temple at the Sivasamundram island is a large structure Hoysala structure enshrining a sculpture of the presiding deity in a reclining posture. Someshwara Shiva temple is another important shrine on the island. Asia’s first Hydro – electric Power Station, established in 1902, is located nearby. B R Hills are a delight for wildlife, trekking and adventure sports enthusiasts. The terrain is dotted with peaks and hill top temples. Billigiri Rangana Temple dedicated to Lord Rangaswamy is the most important shrine. The Ratha (chariot) festival is held here in April. Other places worth seeing are – Dodda Sampige Mara, the 2000 year old giant tree and BRT Wildlife Sanctuary. It sprawls in the foothills of the Nilgiris and is one of the most fascinating wildlife centers in the country. The park was established in 1931, by the Mysore Maharajas and was brought under the ‘Project Tiger’ in 1974. it covers an area of 874.20 sq. kms., adjoining the famous Mudumalai sanctuary in Tamil Nadu and Wayanad sanctuary in Kerala. The lush forest full of teak, rosewood, hone, mathi, bamboo and sandal trees teems with elephant, tiger, leopard, panther, dhole (wild dog), bison, spotted deer, sambar, crocodile, cobra and python etc. Birds like peafowl, partridge, quail, hornbill, ibis, eagle, etc. can be viewed here. Visitors can take a safari on elephant back for viewing the wildlife or hire a vehicle to go round the park. Well planned motorable roads close to the perennial and seasonal water points and adequate open spaces in the forests enables a better viewing. The best season to visit the park is from May to June and September to November. The nearest airport is located at Bangalore which is about 140 km. Mysore is well connected to all the major cities via Bangalore by rail. The Shatabdi Express is a quick and convenient way to get to Mysore from Bangalore or Chennai. Good bus services link Mysore to Madikeri, Bangalore and other towns in Karnataka, Tamil Nadu and Kerala. To know the distances from Mysore click here.